This is a slight variation on the typical Pairpoint base mark. 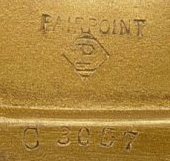 This mark simply says Pairpoint, instead of Pairpoint Co, or Pairpoint Manufacturing Company. The mark shown above still has the typical P and base number.